For the best deals on accommodation in the Cairns Beaches area see our huge selection of packages that will save you time and money. Offering beachfront accommodation just minutes north of Cairns, Amaroo at Trinity features affordable accommodation that doesn't sacrifice on your overall holiday experience. Surrounded by the laid back village atmosphere of Trinity Beach, the resort enjoys spectacular views of the Pacific Ocean. So named for their location opposite Trinity Beach, the self-contained accommodation of Beachfront Apartments on Trinity Beach offers the ideal place to base yourself to explore stunning Trinity Beach, Cairns, Palm Cove, Port Douglas, the Great Barrier Reef, Daintree and more of Tropical North Queensland. A favourite with couples and families, Blue Lagoon Resort offers self-contained accommodation within walking distance of beautiful Trinity Beach and an excellent range of local shopping, dining, activities and attractions. 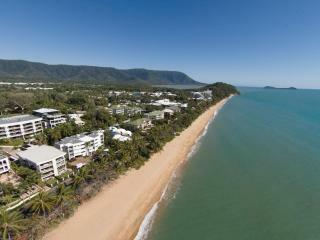 Within minutes you'll find Cairns, the Great Barrier Reef, Cape Tribulation and more. Located on the Trinity Beach Esplanade, directly opposite the pristine beach and convenient beachfront restaurants, Coral Sands Beachfront Resort offers self-contained apartment accommodation surrounded by local activities and attractions and just a 15 minute drive north of Cairns. This is the ideal family tropical holiday location. Situated on the main esplanade of Trinity Beach, On the Beach Holiday Apartments offers well-appointed 1, 2 and 3 bedroom accommodation options. Surrounded by local shopping, dining activities and attractions, the resort is also conveniently located opposite a patrolled swimming enclosure. Offering the best of both worlds, Roydon Beachfront Apartments enjoy a relaxing beachside location with all the convenience of a central Esplanade location, ensuring all your holiday needs are within easy reach. The fully self-contained apartment accommodation features all the comforts of home. The ultimate in luxury accommodation in a stunning beachfront location, Sea Change Beachfront Apartments feature all the modern comforts, a fantastic range of onsite facilities and the unbeatable convenience of all Tropical North Queensland's biggest tourist attractions within a short distance. Ideal for couples and families, Trinity Beach Club Holiday Apartments offers modern, self-contained accommodation surrounded by lush tropical gardens. Just metres from beautiful Trinity Beach, the resort is surrounded by local shopping, dining, activities and attractions and also enjoys a fantastic range of onsite facilities. Offering affordable yet comfortable accommodation, Trinity Beach Pacific is surrounded by local shopping, dining and activities just a short stroll from the beach. The resort is also within easy reach of the main tourist attractions of Tropical North Queensland including the famous Great Barrier Reef. 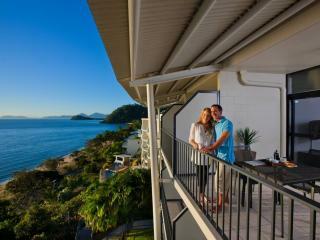 VUE Trinity Beach is a luxurious beachside resort just 20 minutes from Cairns and approximately 45 minutes from Port Douglas. VUE Trinity Beach offers guests a choice of apartments and penthouses that are fully self-contained and have beautiful views of the Coral Sea. Enjoy direct access to Trinity Beach, an excellent range of onsite facilities and a convenient location surrounded by local shopping, dining, activities and attractions when you stay at VUE Trinity Beach.